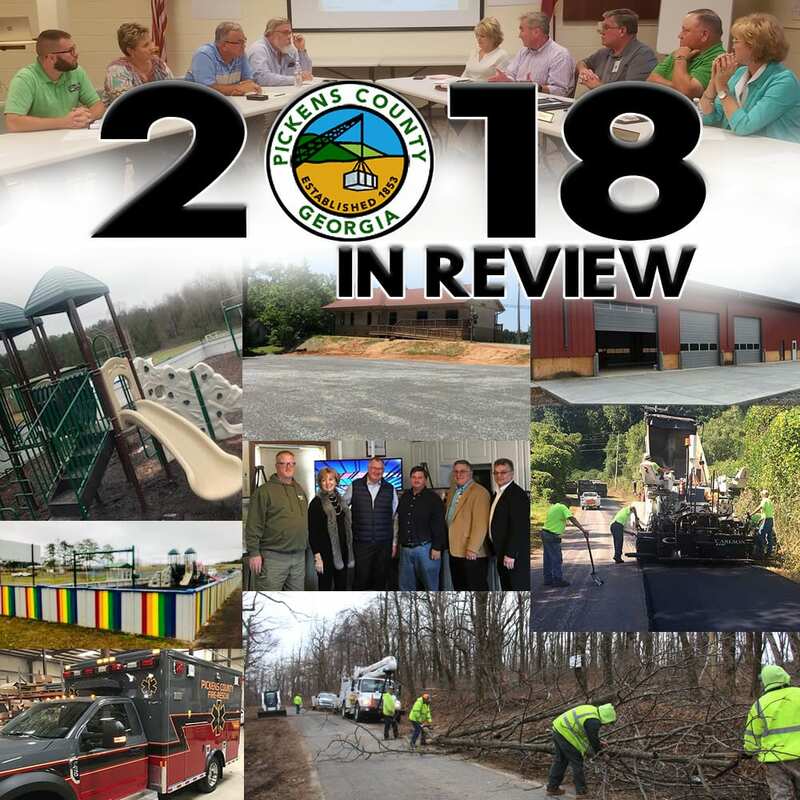 Pickens County Government concluded a busy and productive year with several projects ahead in 2019. Elected officials, department heads, and staff implemented policies and launched new resources to increase the efficiency of operations. The county government improved services provided to the citizens, and increased services offered. The collaboration amongst various departments, and the dedicated public servants paved the way for many accomplishments during 2018. Pickens County Public Works resurfaced 27.66 miles of road across the county, in addition to tar and graveling 3.245 miles of dirt road. This brought a total of roughly 31 miles of road that were asphalted or tar and graveled during the year setting a paving record for Public Works. Additionally, Public Works cleaned up over 500 down trees on right-of-way, installed 111 drainage pipes county-wide, and constructed a new parking area at the Tate Depot. The Water Department installed 77 new meters and installed over 17,000 feet of new water line along Jones Mountain Road that will connect to Gilmer County’s water main. Also, the Water Department and Public Works have been working in conjunction to start an in-house brine operation which will allow roads to be pretreated more efficiently during the winter months. The project will be completed in early 2019. The Department of Planning and Development issued 475 building permits, 123 new business licenses, and renewed 605 business licenses for the year. Also, Planning and Development received 16 rezone requests and revised two county ordinances. The 911 Operations Center received 19,976 total calls marking their busiest year in department history. 8,899 of the total calls were medical responses or fire related. Pickens Fire & Rescue acquired property in Tate to rebuild Fire Station #2. Groundbreaking on the project is set for this Spring. Construction on Carlan Road Fire Station #12 continued throughout 2018 and is expected to open within a couple of months. Further, Pickens Fire & Rescue received an impressive upgrade of ISO ratings that indicates fire service readiness and is used to calculate homeowners’ insurance. The Pickens County Recreation Department had roughly 1,000 kids participate in youth sports and 185 kids attended PCRD Summer Camp. Additionally, with the help of an EMA grant a new Thor Guard lightening detection system was installed around the ball fields, the U6 and U8 soccer fields were redone, and new playground equipment was installed with the help of Pepsi and Southeast Outdoors Solutions. PCRD continues to offer many activities for the citizens: the popular adult sport Pickelball, fitness, karate, and dancing classes. The Pickens Animal Shelter brought in 1,006 animals and adopted out 1,001 animals during 2018. The Pickens County Board of Elections and Registration oversaw four successful elections during 2018. Currently, they are preparing for the 2019 election cycle of city races to be held on November 5th. Overall, Pickens County Government made great progress in providing quality services for the citizens. The Pickens County Board of Commissioners did an excellent job of leading these efforts. As a new year begins, Pickens County Government looks forward to improving our overall operations further for the benefit of our citizens and our county. Stay connected with us by liking our Facebook page: Pickens County Ga Government, follow us on Twitter: @pickensgagov and monitor our website: www.pickenscountyga.gov for updates throughout 2019. As work progresses and projects continue, I will do my best to keep you informed of these developments.